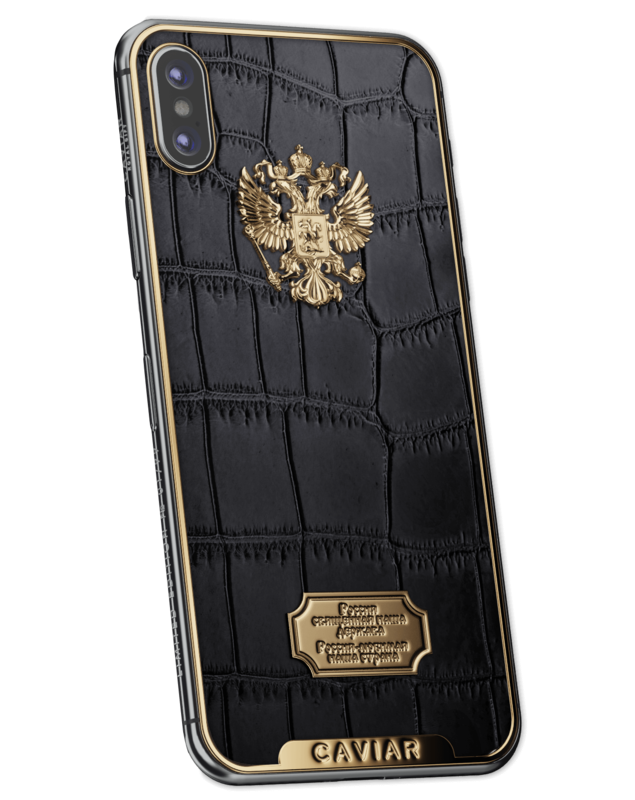 Russia Alligatore The long-awaited premiere in the collection The Wealth of Russia – the “Russia” model on iPhone X performed in the spectacular combination of gold-plating and exotic leather. 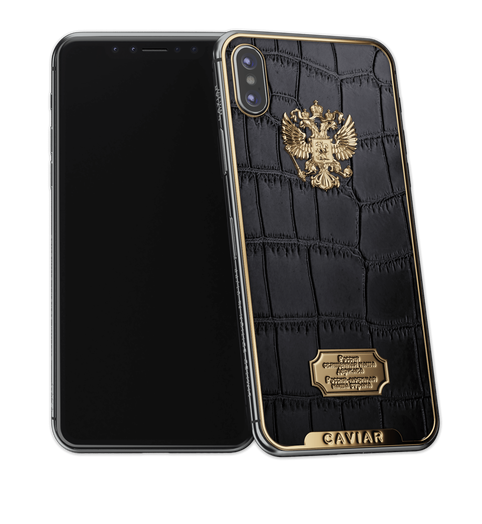 An excellent alliance of the luxurious materials doesn’t leave anyone cold, but is created specifically for those whose business image has become a lifestyle and the feeling of pride of Russia - a confidently selected position. The elegant and noble design of the new smartphone is as luxurious as the previous gold version, but is more moderate and perfectly fits into the business realities that consist of meetings and negotiations on the highest levels. Gold colour left its place to the softness of black alligator leather fabricated according to the traditional Florentine method, but the gold-plated elements in form of a volumetric emblem, a plate with the hymn lines and framing, like spectacular apostrophes are putting the stylistic “accents” in the phone’s design, giving complexity and precious superiority to its appearance. 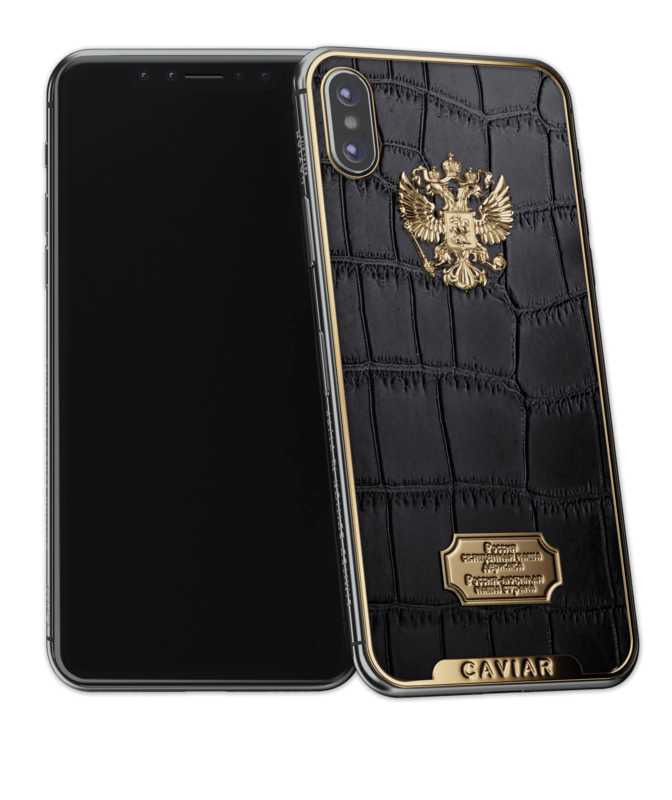 The long-awaited premiere in the collection The Wealth of Russia – the “Russia” model on iPhone X performed in the spectacular combination of gold-plating and exotic leather. 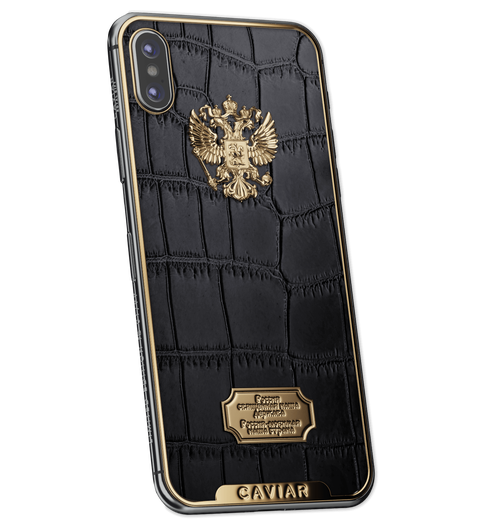 An excellent alliance of the luxurious materials doesn’t leave anyone cold, but is created specifically for those whose business image has become a lifestyle and the feeling of pride of Russia - a confidently selected position. The elegant and noble design of the new smartphone is as luxurious as the previous gold version, but is more moderate and perfectly fits into the business realities that consist of meetings and negotiations on the highest levels. Gold colour left its place to the softness of black alligator leather fabricated according to the traditional Florentine method, but the gold-plated elements in form of a volumetric emblem, a plate with the hymn lines and framing, like spectacular apostrophes are putting the stylistic “accents” in the phone’s design, giving complexity and precious superiority to its appearance.